If you have hobby of playing guitar and want to learn keys musical notes of a song correctly, Guitar Pro is a right choice. Guitar Pro is an application for creating, editing, and studying the arrangement of a song that comes with musical notes or tablature. If you want to learn to play music, you will be guided to play the keys that must be pressed to musical instruments correctly in order to get the rhythm and melody of a song. Although using the name Guitar Pro, this app not only displays musical notes for guitar, but also include other instruments such as bass, keyboard, piano, drums, and even vocals. Everything is displayed in notation form or tablature with sufficient detail. Especially for guitar, lots of configuration options that can be selected according to the output sound will be produced. You can choose a variety type of sound provided, ranging from acoustic to electric. By default, the sound output are produced using MIDI format. To get the sound effects that approaching original musical instrument, you have to add a few add-on applications such as RSE (Realistic Sound Engine) and also Soundbank. Add-on is useful so that the resulting sound output will be similar to the original sound of real instruments. Unfortunately, to get a second add-on, you have to incur additional costs, no matter whether you are using Guitar Pro paid version or demo. To start learning, first you have to find yourself first tabulation or musical notes of a song. Because, Guitar Pro does not provide it and just acts as supporting facilities. You can look it up on the internet, for example on the website Ultimate Guitar Tabs and Guitar Pro Tabs. On the official website of Guitar Pro itself, there is a link to a site that offers thousands of tabulation MySongBook songs from a variety of musicians and genres of music. On this site there is also a video tutorial for users who want to learn more about the features that are offered and how to use Guitar Pro. 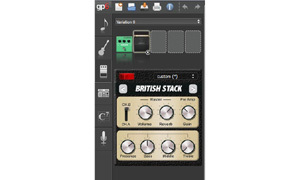 Interestingly, Guitar Pro is also available as a mobile application on the Android and iOS platforms. The price starts from U.S. $ 5.29 for Android and U.S. $ 7.99 for iOS. 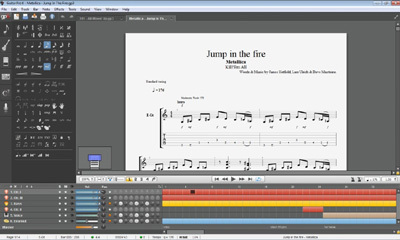 Guitar Pro has a feature complete support for those who want to learn a song in an instant. The application also comes with clear guidelines. In addition, the application also allows you to make arrangement of a song. This panel lets you add all sorts of guitar sound effects on a particular track. You can save the effect settings that have been done up to 4 variation effects. Useful MIDI tuner to tune guitar in a way that produced tone equated with speech output MIDI guitar. Soundboard featuring some of the instruments being played. This application also allows you to enable, set up volume, panorama, and apply equalizer of each instrument. 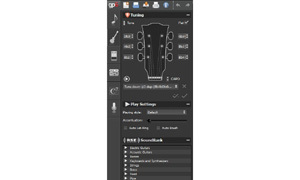 Plus: a complete tuning settings; many features supporting; quality good sound output (using the add-on); include manual; does not only show guitar instruments. Minus: For the tabulation of a song, the user must find their own from the internet; application add-on not free.